The family of a Cumbrian human rights worker who is being been held in Angola on suspicion of espionage hope she may soon be allowed to return home. Sarah Wykes was working for the charity Global Witness when she was detained in the oil-rich province of Cabinda. She was jailed on 18 February, but later released on bail and confined to a hotel amid claims of spying. Her sister, Caroline Kennedy, who lives near Carlisle, said she hoped to be told about her future on Wednesday. Ms Wykes had flown into Angola on 11 February and arrived in Cabinda with a colleague a few days later. Shortly afterwards she was arrested and accused of espionage. Global Witness, which describes Ms Wykes as a highly respected anti-corruption campaigner, has condemned the actions of the Angolan authorities. Mrs Kennedy said: "I spoke to Sarah yesterday. She is reasonably positive and trying not to be too anxious. "She told me she was being accused of espionage, but as far as I know the Angolans have not provided any evidence. "The family is bearing up well, but obviously we are all very concerned." 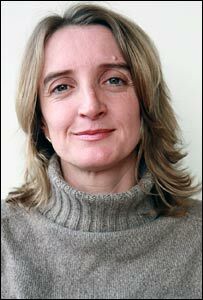 A spokesman for Global Witness said: "Dr Wykes still does not know exactly what she is accused of. "Since the case against her is baseless, the delays in the paperwork are creating a pointless obstacle which is causing distress to all involved." Oil accounts for 95% of Angola's export revenue, but most of the country lives in extreme poverty. The government has been criticised by local and foreign groups who are pushing for greater scrutiny of oil accounts and a fairer redistribution of oil revenues.